Adding a cargo carrier can be like adding another room! As much as I enjoy living in a van, eventually the pressure of occupying a small space gets to a person. Just like in a house, occasionally there are things – must haves – that slowly start to multiply. Eventually they almost drive you out of the living space. Some of the things that take up space (and drive me nuts in the process) are: clothes, cook stoves (I have two), miscellaneous hardware, jugs of water, plastic bag camping showers, and the Honda generator. Many of these things can be carried or stored outdoors. That is why I bought this cargo rack. The Pro Series carrier was only $115 (including shipping!) on Amazon and is very well built. It is one of the highest rated models and yet one of the lowest priced. The 500 pound capacity is more than sufficient. Even better, this rack is larger than average at 24 inches by 60 inches. 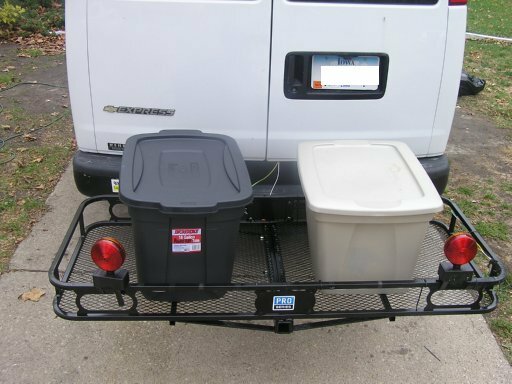 Most hitch mounted carriers are only 20 inches front-to-back. It is surprising how many items are just a little too large for the other racks, particularly some of the plastic totes. So how big is this thing? I should be able to fit three 18 gallon tote pans as well as the generator! Assembly was quick and easy. A socket set and some combination wrenches were all that was needed. The instructions suggest using a torque wrench but being a big guy, I know I torqued the sh** out of it without having to have something verify that. 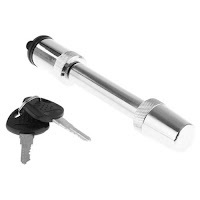 You will need a quality 5/8″ hitch pin but preferred is a locking model. The only real problem is security. Without locking things up they might disappear – even in Iowa. The clothes and other camping tools are helpful but if they were stolen, the financial loss would be negligible. But leave the $1000 Honda generator on the cargo carrier in a public setting and it will likely disappear in minutes! Ouch! I plan to build a storage box, line it with metal, and then cover the outside with metal (diamond plate, perhaps?) The box will have a powered fan and an intake louver to allow the generator to be run while securely locked to the cargo carrier. When not in use, the generator will actually be stored inside the van just in case of a theft attempt. (I plan to hide the Luggable Loo toilet in the generator enclosure some of the time). So why a generator box? The Honda is not waterproof and there have been times electricity was needed but it was raining. It would be nice to run the air conditioner during a humid summer rain, etc. Is stealth compromised with the rack? Not necessarily. Besides, most of my camping is in campgrounds, Walmart parking lots, state rest areas, at Anytime Fitness locations, or on state wildlife management lands. No stealth is needed in those settings. Also, should a trip need to be incognito, the rack can always be disconnected and stored in a garage for as long as needed. By the way, the lights you see in the picture did not come with the cargo rack. I bought a little magnetic mount set of trailer lights for $20 at Menards and fastened them securely using cable ties and some tape. Hopefully having indicators for turns and braking will make driving a little safer. So why did I go with a cargo rack instead of a cargo trailer? There were several reasons. The cost is far less. No extra licensing is required nor is any extra insurance. The rack does not limit my maneuverability and should not impact the gas mileage significantly. It can also be removed and stored in minutes. It sure is great to have a little extra living space again and not be tripping over the camping stove or sleeping on clumps of laundry. For the sacrifice of some degree of stealth, it is nice to have things a little tidier. That does look to be a good sized cargo rack. Looking forward to seeing how the box to hold the generator gets built. Enjoying following your Van living, lots of good ideas.